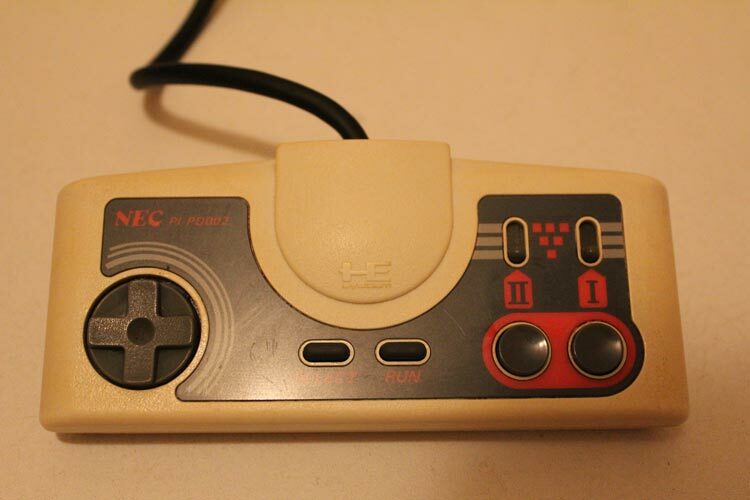 The two controllers at the top are the original model PC Engine controllers, and they are filthy! It’s all good though, because they were extremely cheap. Underneath them is a PC Engine multitap and a very shiny black PC Engine controller. Those aren’t the topic of this post though, it’s those dirty PC Engine controllers that are in need of some TLC! So, PC Engine – great machine, nice controllers, shame about the length of the controller cables. 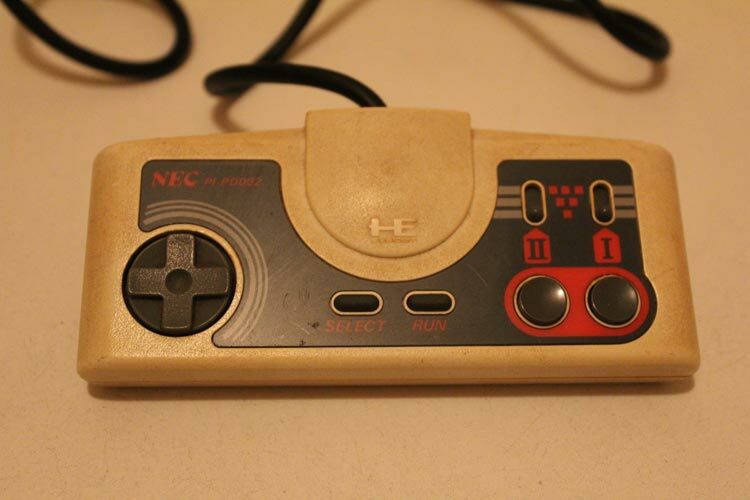 They obviously took that cue from Sega – the Mega Drive and Master System controller cables were always a bit on the short side too. On most of my other consoles I’ve grabbed cheap third-party extension cables for the controllers and they all work a charm. The PC Engine though, that’s a different story. But the answer’s simpler and cheaper than you’d expect! 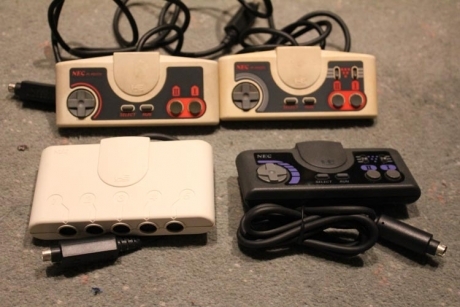 Tim over at The Retro Review Project wrote a post a couple of years back where he found that Mac serial cables had the same 8-pin mini-DIN connector as the PC Engine controllers’, so I thought I’d give it a whirl. 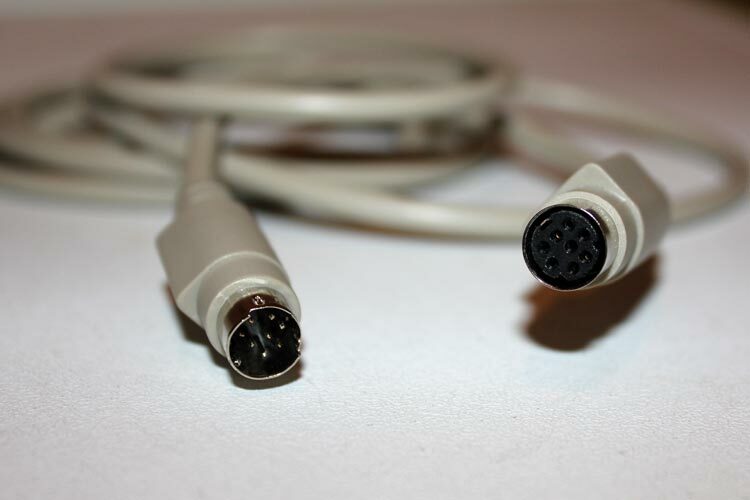 After a false start (I bought a male-male Mac serial cable instead of a female-male cable), I’m happy to confirm that 8-pin mini-DIN Mac serial cables work perfectly, and as a bonus, they’re also really inexpensive. I can now game on my Duo-R in comfort on the couch and no longer worry if I’m going to accidentally unplug the controller or pull the whole console off the shelf. Bonus. There’s no such thing as too much love for Phantasy Star. 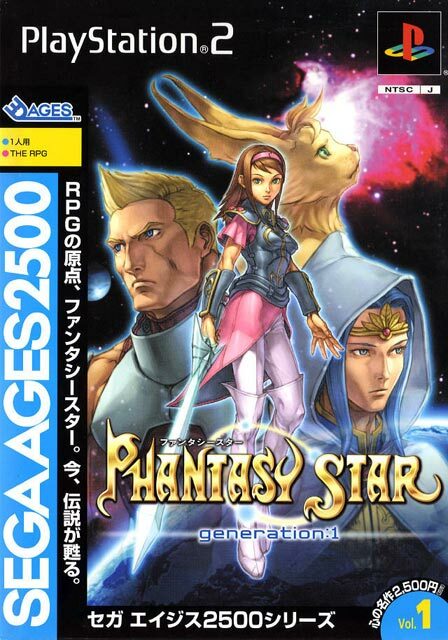 For this FAQ, I’ll list all the resources I used to finish Phantasy Star: Generation 1, the Sega Ages 2500 remake of Phantasy Star, as well as some hints that the existing guides and FAQs have missed. Bokokun’s Lists FAQ (GameFAQs): It’s in shift-JIS, so make sure you have Japanese fonts installed. I can read hiragana, katakana and a bit of kanji, so Bokokun’s guide was a godsend in filling in the gaps when my brain wouldn’t articulate everything correctly 🙂 Especially noteworthy is his guide to the Collaboration system, which saved my bacon on the final boss fights. Dark Vortex’s (Quan Jin’s) Phantasy Star FAQ (Sega Master System; GameFAQs). For the areas where Omar’s guide skimmed over pretty quickly, all the necessary info was neatly tucked away in Dark Vortex’s FAQ for the original Phantasy Star on the Master System. To be honest, any of the FAQs for PS1 would suffice, I just happened to prefer Dark Vortex’s. The other thing I did to make life easier was to hack my levels to save on grinding – in the first instance, I bumped Alis to level 60-ish; later on when I amassed the rest of the party, I was pleased to see they all leveled up with Alis even when they weren’t in your party. Later into the game, I noticed in a few battles things were getting a little dicey, so I hacked my characters again to level 95 (or 9,000,000 EXP!) to finish off the game. You’re welcome to grind to your heart’s content, but I’m time poor and as much as I adore the early Phantasy Star games, PS1 and PS2 are too grind-heavy these days. I’ve already done the hard yards back in the day, so I was lazy with the remakes 😛 I’ll be posting an updated guide on hacking the experience levels of the other characters in the future, and will look at uploading a guide to GameFAQs as well at some stage. Talk to the man at Eppi (village leader), get Hashim’s Key (Hashim no kagi), talk to the village leader again, consult (L1), goto Parolit, talk to Mary (Meari-), and you should get the Naula Key (Naura no kagi) to enter Naula Cave. The Toriada Key (Toriada no kagi) is in the brown house in Gothic. Use it to enter Toriada Prison. To obtain the Bortevo Key (Bartevo no kagi), in Bortevo go to the top-right house, talk to Garingu and you should get the Bortevo Key (Bartevo no kagi). Consult a few times prior to getting it as I remember Myau mentions Garingu. After obtaining the polymetal, you’ll find Haspy by searching the bottom-right house in Bortevo. This one drove me nuts, so here’s how I got the dragon to appear in the dungeon. Goto Casba, talk to the people in there, especially the girl Natalia (Nataria), consult, then goto Uzo and talk to Vivian (Bibian), consult, talk to the rest of the townspeople in Uzo, head back to Casba, talk to everyone and by now you should be getting plenty of people talking about the Blue Dragon in the dungeon. Consult, save then head back into the dungeon, and he should be there. Remember to head to Bortevo afterwards to grab the hovercraft. Head to the building next to the save game panel and search it – Hapsby will nerd it up and you can jump into it by pressing R1 when you’re next to the water (saves going into your inventory to active it every time). Omar notes Aukaba as Twintown; doesn’t really matter, but when all my characters started talking about Aukbara no machi, it confused the buggery out of me. Having only played through Phantasy Star on the SMS once, I had a d’uh moment when I arrived and realised they were one and the same. Go me! I can’t take credit for this one – Busterbeam over on the GameFAQs board pointed this out ( the original thread is here). To gain entrance to the Guaron Morgue, here’s the full list of what I did: I talked to the two Head Dezorians in Aukuba (they’re in red outfits, each in their own house either side of the town entrance), consulted, went to Guaron, got denied twice, consulted, returned to Aukuba, talked to the Head Dezorian on the left, consulted, returned to Guaron Morgue, and was permitted entry. Thanks Busterbeam! This one’s an anomally – using consult after finishing the Guaron Morgue and before heading into the Ice Dungeon, at the end of a conversation Alis exclaims “Ha-a-a [X] [Triangle] [Square] [O] [Triangle] [Square] [O] [X] [X]”. I’ve no idea if this is a fancy cheat or code, but thought I’d note it down regardless. I think that covers it – again, huge props to the authors of those FAQs, I wouldn’t have even hoped to have made it through Phantasy Star: Generation 1 without your help!